It’s been a while since we talked about making the switch from conventional products to non-toxic, more natural products. 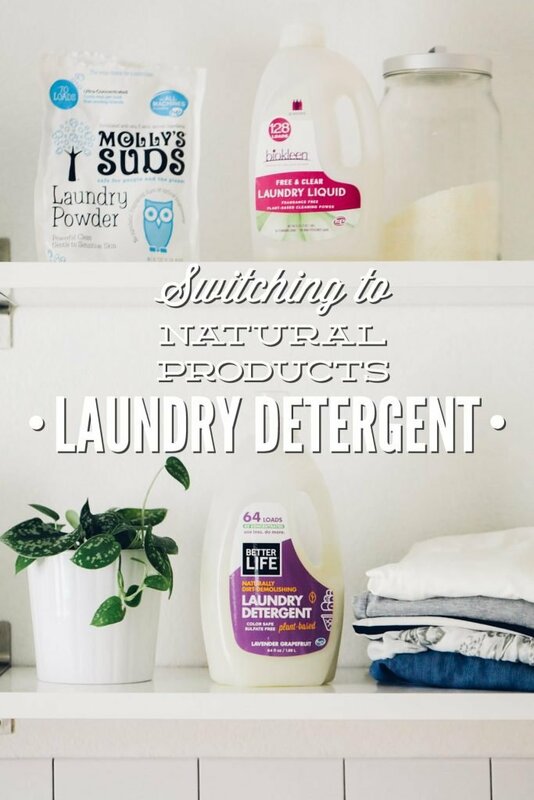 Today, we’re going to get back to our make the switch chats, starting with laundry detergent and soap. First, let’s recap the purpose of these chats. Suzi also talked about this concept on the podcast last week (Episode 11 and 12), in regard to switching out conventional skincare and makeup products for more natural options. 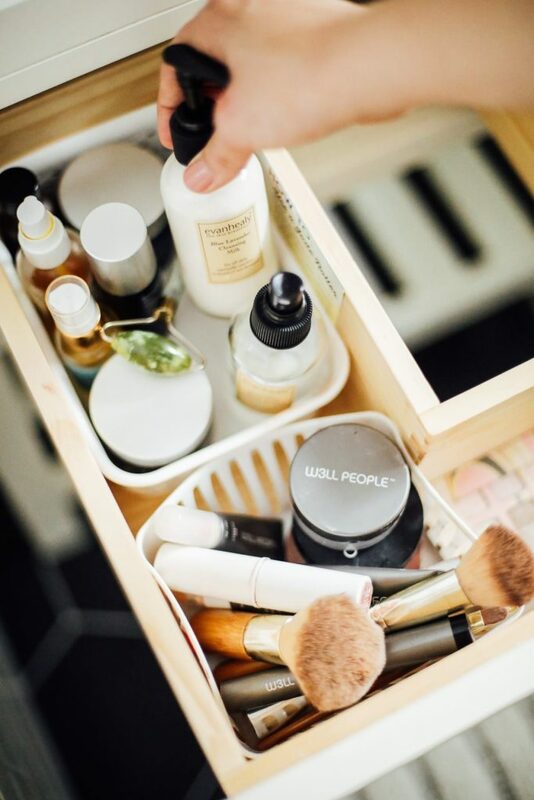 She suggested starting with the skincare and makeup products you use the most, and looking for natural options as the products run out. Frequently used products are the most important products to start with since they are being used frequently our skin and around our home. In your own life, you may choose to switch out skincare products first, and then move on to household cleaners. Or, vice versa. Maybe you’ll want to do a complete overhaul at once. Whatever you choose to start with, and however you go about making this switch, I hope our “make the switch” chats will provide you with a foundation to build upon. 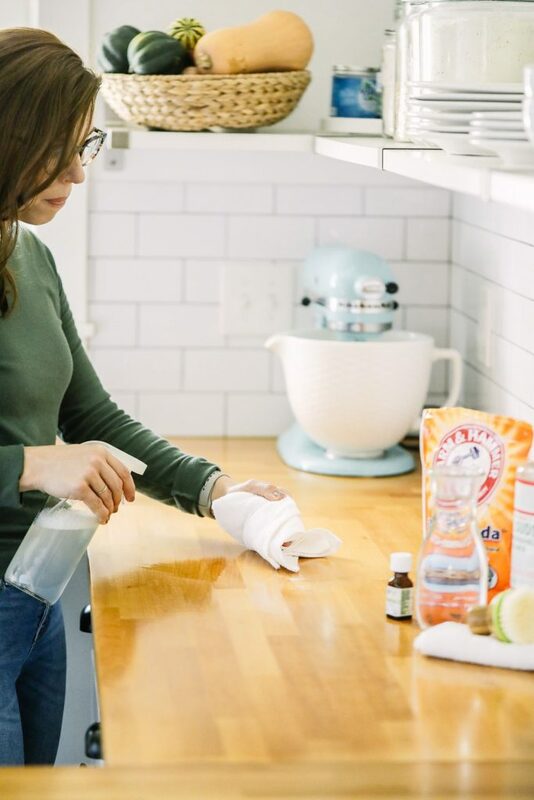 So far, as a community, we’ve talked about making the switch to natural toothpaste, dish and dishwasher soap, all-purpose cleaner spray, deodorant, sunscreen, and shampoo and conditioner. When making the switch to non-toxic products, I recommend using the EWG or the Think Dirty App. These resources allow you to scan or write in a product, or the ingredients used, and get feedback about the ingredients and how the product rates on a toxicity scale. Neither resource is perfect, but right now these are the best resources we have, besides contacting a company directly, for learning about brands and ingredients. Also, side note, if the product you’re using for laundry (or any cleaning or skincare job) doesn’t disclose ingredients, that’s a big red flag. Brands should be proud of their ingredients and be willing to disclose what’s used in a product. Finally, before we talk about laundry options, let’s chat about fragrance for a minute. I’m often asked when it comes to using homemade laundry soap, if there’s a way to make the fragrance used (essential oils in this case) stronger and more apparent on garments. Natural fragrances will never be able to compete with synthetic fragrances, so it’s impossible (at least to my knowledge) to make or purchase a product that’s truly natural and also has a fragrance that’s as strong as something like Tide. This doesn’t mean you can’t enjoy fresh-smelling clothes and towels. Now, if your clothes stink after washing them, your laundry soap (or detergent) may not be working very well and you need to try something else that will work better with your water or garments, or you may need to try adding some vinegar to the wash cycle to kill off some bacteria in your workout clothes. Clothes that are washed with natural laundry products, even scented products, shouldn’t carry a strong fragrance with them. If there is a fragrance used, it’s going to be subtle. But garments should always feel, smell, and look clean after a wash. Clean smells…clean, not like a particular fragrance that’s designed to give us a feeling of something being clean. 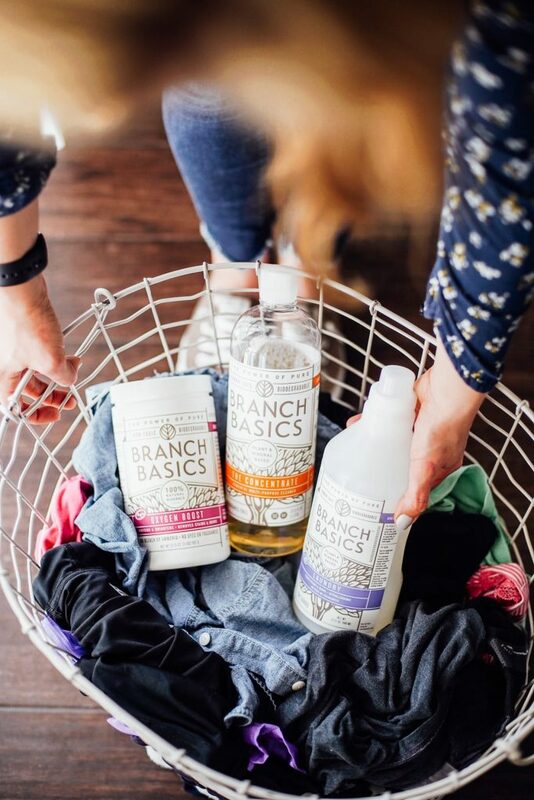 Branch Basics is unique in that you only need one single concentrate soap to clean your entire home, including dirty laundry. When you purchase a starter kit, you receive the concentrate, oxygen booster (great for laundry, particularly dirty and stained garments), and 5 bottles to make your own cleaner in different ratios (provided on the side of each bottle) using that one concentrate. I was skeptical about this one product multiple uses claim, but seriously this laundry soap (and the concentrate used to “make” the laundry soap) is amazing. It’s my favorite non-toxic laundry soap to date. If you want to go the homemade route, I have three recipes on the blog: powder soap without Borax, powder soap, and a liquid soap. All three recipes are made with castile soap as the base. I’ve experienced great success with homemade laundry soap; however, I don’t make my own soap at this point since I’d rather invest this time in being with my family or cooking a meal. If you have the time, going the homemade route can definitely save you money and you know exactly what’s going in your product. You can add essential oils to your soap to give it some scent, but again, the fragrance will be subtle. 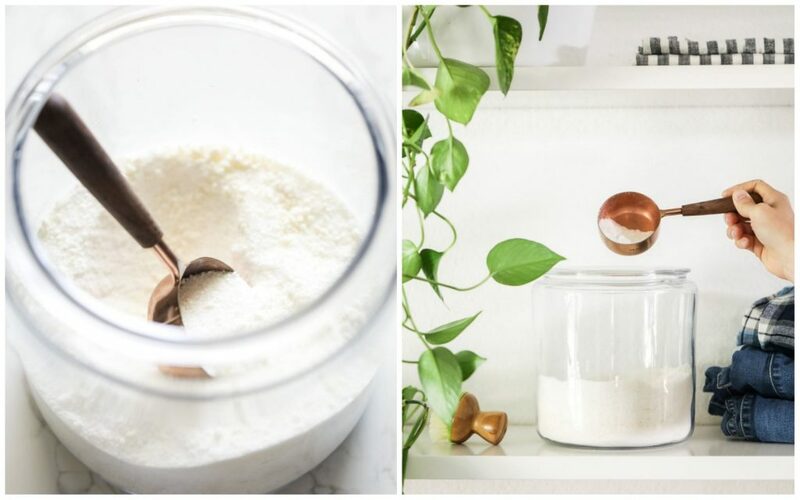 The beauty of soap nuts is you don’t have to actually make anything, so if you’re strapped for time but don’t want to go with a store-bought laundry soap or detergent, this is a great option. Soap nuts are actually dried berries which produce saponin. The berries clean garments without any powders or liquids. You can purchase soap nuts through a number of companies. I like EcoNuts (linked above). This soap is my second favorite liquid soap option. It cleans clothes, even the dirty clothes that are covered in dirt from the park. The lavender grapefruit version is lightly scented and just delightful, in my opinion. I’ve been able to find this laundry soap at health food stores, Whole Foods, Vitacost, and Amazon. This particular laundry detergent receives an A grade from the Environmental Working Group. BioKleen makes a bunch of different laundry detergent options, ranging from cold water liquid detergents to powders. 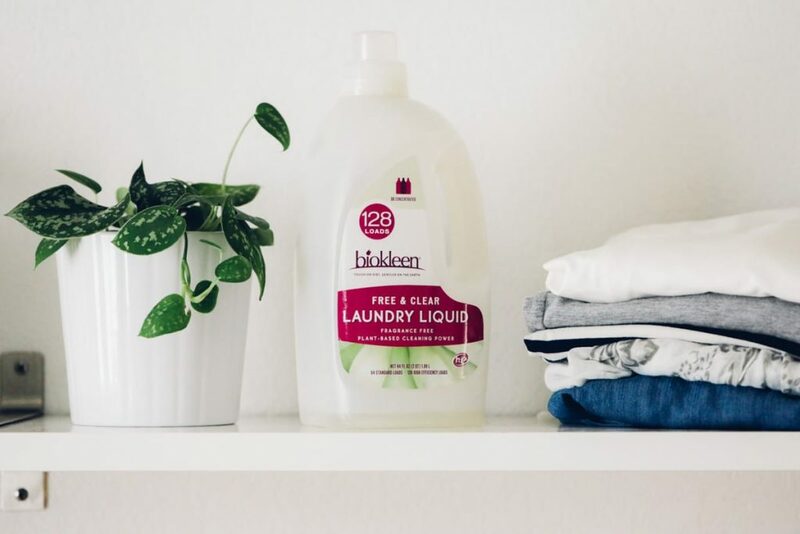 I really like BioKleen and find all the laundry products to work very well. My only issue is this brand isn’t always easy to find. Whole Foods doesn’t carry BioKleen, at least my local store doesn’t, and I’ve never seen this brand at conventional stores. You can find BioKleen on Amazon and Vitacost, and at some regional health food stores. When it comes to powder laundry options, Molly’s Suds is my favorite. 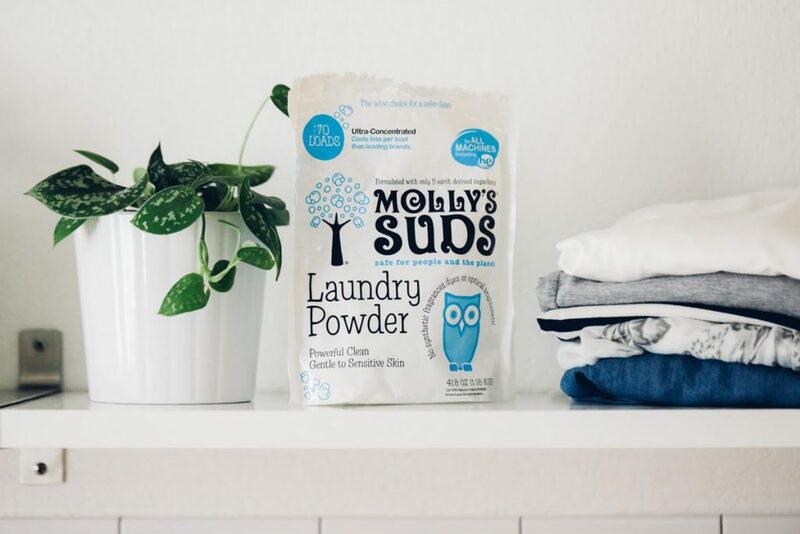 I’ve tried just about every “natural” laundry powder out there, and Molly’s Suds works the best, in my opinion. Molly’s Suds offers a variety of options, including a whitening powder and dryer balls. Amazon and Vitacost both sell Molly’s Suds, along with some health food stores. Molly’s Suds also makes liquid laundry detergent, but I’ve found the price is steep for what you get. The powder is definitely the way to go with this brand. Seventh Generation is the easiest less-toxic brand you can find on the market. 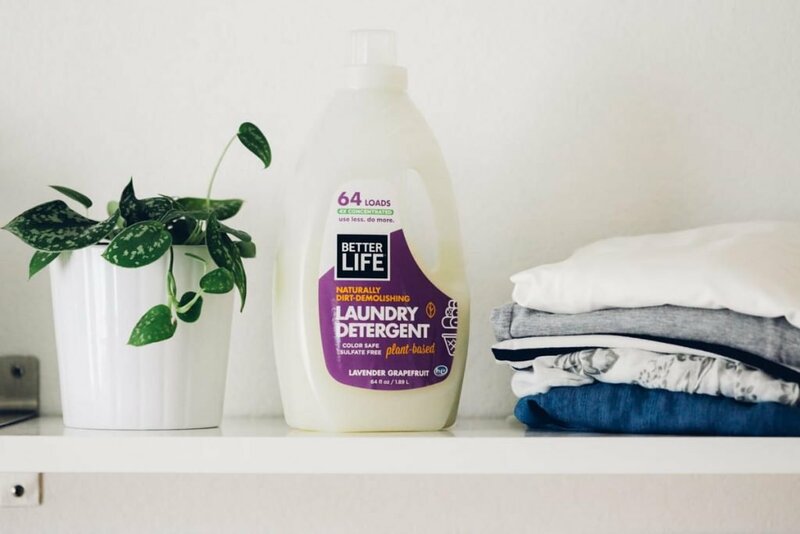 Not all Seventh Generation laundry products are stellar (the liquid detergent recieves a C with the EWG), but some of them, particularly the laundry powder, score very well on the low-toxicity scale with the Environmental Working Group. That said, I would rather use the Seventh Generation liquid detergent over something like Tide. We’re not going for perfection here, but we do want to be informed about the products we’re using, and I think Seventh Generation does a good job at disclosing what’s in their products. Seventh Generation also makes “pods” that rate very low on the toxicity scale. I haven’t tried the pods before so I’m not sure how well they work. I have used the powder soap many times. There are so many non-toxic products on the market now. It would be difficult for me to try every option available, since products can be found from big companies, small regional companies, and local shops that sell on Etsy and at markets. The idea of these chats is to give you a few suggestions for each category, based on what I love. If you’ve tried a product, feel confident about the ingredients, and love the product, I would love for you to share your recommendation in the comment section, below. Hey Maggie, Thank you for sharing! Hi Kristin! I have found Biokleen at Natural Grocers here in AZ. Also, I am so excited to try the Better Life brand. I currently use their liquid dish soap and it works fine. ? That’s awesome, Debbie. Better Life is so good. Hi Kristin! I’m loving the podcast. Thank you for taking the time to make them happen…so much good information. I’ve been using Charlie’s Soap for a while. Only 3 ingredients and has been working great on my clothes. Available direct or Amazon or Vitacost. Hey Noella, I’m so glad you’re enjoying the podcast! Thank you for sharing! I’ll have to pick up some Charlie’s Soap. Thank you so much for the recommendations, Kristin! I’ve seen a few of these brands, but some that you mentioned are new to me. I’m so curious about using the soap nuts, and also the Better Life brand…I’ll have to check them out! I’m using My Green Fills and love it! It works so well! The concentrates come in recyclable packets and you reuse the same container each time. Any luck on finding a disinfectant to add to the washer? I used Shaklee’s G liquid in the past but too much chemicals in it.